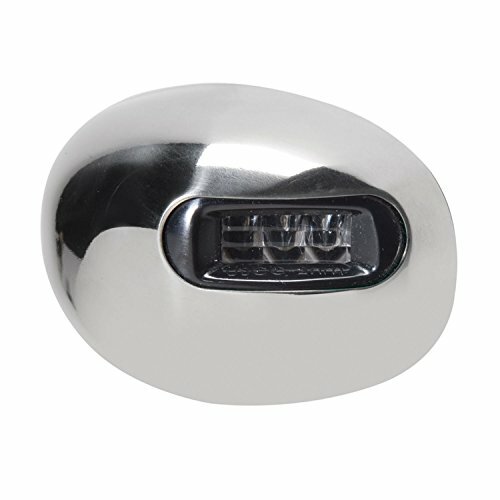 LED Sidelights - Vertical Mount. Sold as a pair. Operates 9-16 volt DC systems. 3 LED configuration. For powerboats under 20 meters. 50,000 hours of service life. Requires .375" hole. Energy draw 65 milliamps. Transparent lens. Cool to the touch. Stainless steel housing. Hard wire leads. Permanent Snap on cover. 3.37" x 2.30" x 1.42". Color: Stainless Steel. 3 LED configuration. For powerboats under 20 meters. Color: Stainless Steel. Energy draw 65 milliamps. Transparent lens. Cool to the touch. Stainless steel housing. Hard wire leads. Permanent Snap on cover. Box Dimensions: 3"H x 7"W x 10"L. Weight: 0.7lbs. If you have any questions about this product by Innovative Lighting, contact us by completing and submitting the form below. If you are looking for a specif part number, please include it with your message.